A brief history and review of geopolymer technology is presented with the aim of introducing the technology and the vast categories of materials that may be synthesized by alkali-activation of aluminosilicates. 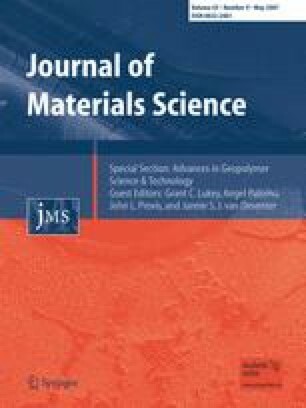 The fundamental chemical and structural characteristics of geopolymers derived from metakaolin, fly ash and slag are explored in terms of the effects of raw material selection on the properties of geopolymer composites. It is shown that the raw materials and processing conditions are critical in determining the setting behavior, workability and chemical and physical properties of geopolymeric products. The structural and chemical characteristics that are common to all geopolymeric materials are presented, as well as those that are determined by the specific interactions occurring in different systems, providing the ability for tailored design of geopolymers to specific applications in terms of both technical and commercial requirements. The authors gratefully acknowledge the financial support of the Particulate Fluids Processing Centre (PFPC), a Special Research Centre of the Australian Research Council (ARC). Also to the Spanish Directorate General for Scientific Research (Ministry of Education and Science) for the financial support of the project BIA2004–04835 and the CSIC for the I3P contract (Ref. 13P-PC2004L) co-financed by the European Social Fund. We also acknowledge the work of David Brice in collecting XRD diffractograms of metakaolin derived geopolymers, and thank Redmond Lloyd for providing the TEM micrograph of fly ash derived geopolymer.